Earlier today, Facebook has released its second Global Government Requests Report which listed down the amount of data request that the popular social media company has received from governments throughout the world. Covering July to December 2013, the report is the follow-up to the report that the company released in August 2013. According to the report, Malaysian government has made 16 requests in the second half of 2013 which involved 24 accounts. 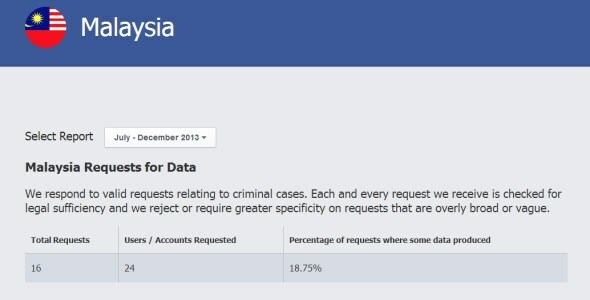 Apparently, 18.75% out of these requests led to the release of an unknown amount of data by Facebook which means the company has complied with 3 requests from Malaysian government. While the number of requests and approvals might be quite small, Facebook previously has rejected all the requests that Malaysian government submitted from January to June 2013. According to Facebook’s general policy, the company only responds to requests that related to criminal cases. Hence, it made us wonder the nature of the cases that were involved in the requests from our government to the extent that Facebook actually responded to them. Hmm. Nokia RM-978 Spotted On SIRIM’s Database: Lumia 630 Dual SIM Coming Soon To Malaysia?